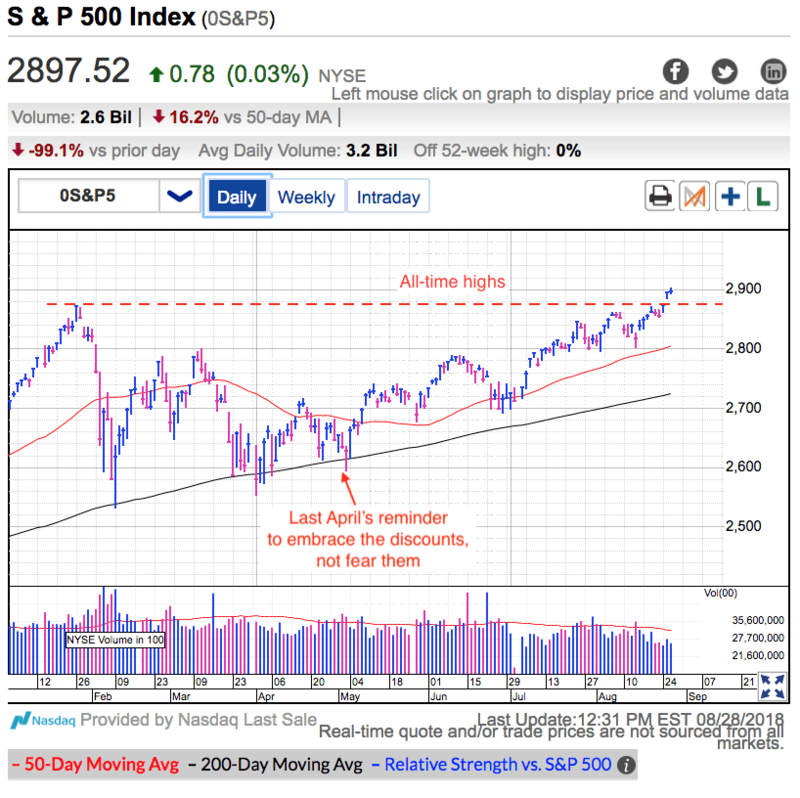 Tuesday morning the S&P 500 poked its head above 2,900 for the first time in history. The market continues basking in the after-glow of Trump’s Mexican deal that triggered Monday’s breakout to all-time highs. Unfortunately Mexico is only one piece in a much larger puzzle. Canada’s, Europe’s, and China’s trade deals remain elusive. All the work ahead of us is why the celebration was shortlived and we slipped under the psychologically significant 2,900 level in late-morning trade. That said, 2,900 is a major milestone no matter how you cut it. This strength is impressive and caught a lot of people off guard. Not long ago the crowd was overrun by doom and gloom and predictions of the market’s collapse were everywhere. Between trade wars, rate hikes, rising interest rates, Turkey, Italy, Iran, and all the other drama thrown our way this year, it is no surprise traders were so negative. The S&P 500 is up 10% since I wrote those words back in April. 10% is a great result by itself. It is even better if a person took advantage of leveraged ETFs. But far and away the best trade of the year was profiting from these fantastic swings between optimism and pessimism by buying weakness and selling strength. Buy the dip, sell the rip, and repeat until a good year becomes a great year. While it is fun to look back at my successful trading calls, what readers really want to know is what comes next. Luckily for us today’s strength doesn’t change anything. The best trade is still buying weakness and selling strength. The problem with today’s hope is it will be replaced by disappointment in a few days. Today we see light, in a few days we come across another stumbling block. And like clockwork, the market continues its swings between hope and despair. If the best trade is buying weakness and selling strength, no matter how safe 2,900 feels, this is definitely the wrong time to be buying. Resist the temptation to chase these prices higher because recent gains made this a far riskier place to be adding new money. The risk/reward shifted away from us because a big chunk of the upside has already been realized while the risks of a normal and healthy dip increase with every point higher. In fact, if the best trade is buying weakness and selling strength, this is actually a darn good time to start thinking about locking-in profits. Remember, we only make money when we sell our winners and it is impossible to buy the next dip if we don’t have cash. While I am cautious with my short-term swing-trades, this market is acting well and there is no reason to abandon our favorite medium- and long-term investments. We are still setting up for a strong rally into year-end and the only thing to do is patiently watch the profits pile up in our favorite long-term investments. 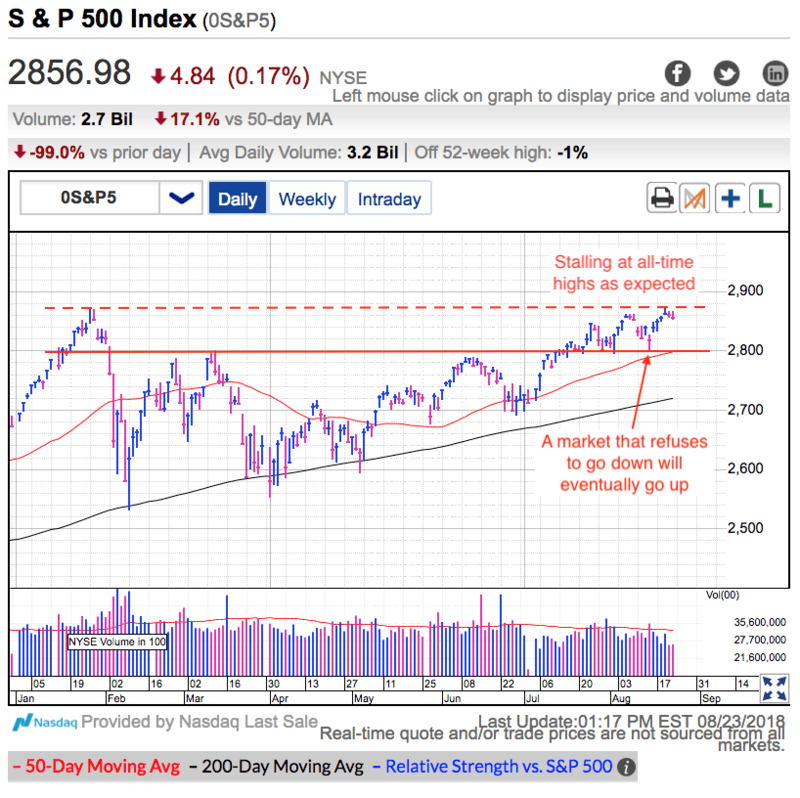 On Thursday the S&P 500 finished modestly lower after drifting sideways for most of the day. Headlines continue to be negative for Trump, but as expected, the market doesn’t care. I don’t expect the market to overreact to these Cohen headlines because anyone who was paying attention saw this coming a mile away. Remember, we fear what we don’t know, not what everyone else is talking about. There are real risks lurking out there, but this is not one of them. The market is a little more vulnerable to these headlines simply because we are at the upper end of the trading range and a cool down was inevitable. If it wasn’t these headlines, it would have been something else. We are still stuck in the slower summer months and we won’t have the firepower to push a large directional move until institutional money managers return from their summer cottages. Until then we should expect these smaller directional moves to fizzle at the edges of the trading range or one reason or another. The growing Trump scandal isn’t dampening the market’s mood and traders are not concerned about recent developments. These events first came out months ago and if prices were going to tumble, they would have done so back then. The fact we didn’t sell off initially tells us we don’t need to worry about these headlines today. If the market doesn’t care, then neither should we. The market’s benign reaction the last two days confirms that outlook. It’s been a while since Turkey and trade wars made the headlines and our “no news is good news” market continues hovering near all-time highs. While confident owners have zero interest in selling the news, it is harder to convince those with cash to buy these highs and is why the gains have stalled. We are at the tail end of the slow summer season and it will be a few more weeks before we start seeing more meaningful buying. Many money managers are underweight stocks because they sold defensively earlier in the year. These managers have been desperately waiting for a pullback so they could jump back in. Unfortunately, the market is not cooperating and this latest round of gains is pressuring them to chase prices higher. Once they give up waiting for the pullback, they are going to be forced to bite the bullet and buy stocks at all-time highs. The breakout is not imminent, but it is coming. Even though the market is acting well, we are still vulnerable to near-term volatility. Risk is a function of height and it would be normal, even routine for the market to dip modestly here. Prices are responding well to these Trump headlines. That means we are more likely to go higher than lower, but the risks of a small dip are always there. As long as we know what to expect, we are less likely to overreact to a modest bump in the road. At this point, any dip is a buying opportunity, not an excuse to sell stocks. Remember, we take profits by selling strength, not weakness. If someone is not sure they can sit through a small dip, they should take profits now. Otherwise, there is nothing to do other than patiently watch the profits pile up.